Kids will enjoy Sea World Theme Park and Surfers Paradise Beach. When in Gold Coast, make a side trip to see Tamborine Mountain Distillery in Tamborine Mountain, approximately 46 minutes away. There's still lots to do: get in on the family fun at Warner Bros. Movie World, admire nature's wide array of creatures at Currumbin Wildlife Sanctuary, look for all kinds of wild species at David Fleay Wildlife Park, and enjoy the sand and surf at Coolangatta Beach. 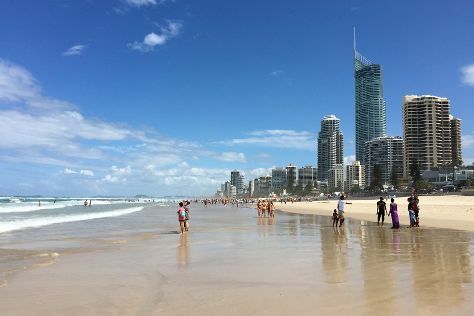 To see where to stay, traveler tips, and other tourist information, you can read our Gold Coast trip planner. Singapore, Singapore to Gold Coast is an approximately 11.5-hour flight. You can also do a combination of flight and train. Due to the time zone difference, you'll lose 2 hours traveling from Singapore to Gold Coast. Plan for cooler temperatures traveling from Singapore in June, with highs in Gold Coast at 24°C and lows at 13°C. On the 23rd (Sun), wrap the sightseeing up by early afternoon so you can travel back home.